On March 10th, 1959, thousands of Tibetans rose up to protect their leader, His Holiness the 14th Dalai Lama, and to protest China’s invasion and occupation of their country. As the protests intensified, Chinese troops responded with fatal force. On March 17th, the Dalai Lama began his harrowing escape to India on horseback. In the following days, the Chinese army took full control of Lhasa. Tens of thousands of Tibetans were killed and imprisoned in the months that followed and thousands more fled persecution by making the dangerous journey into exile in India. 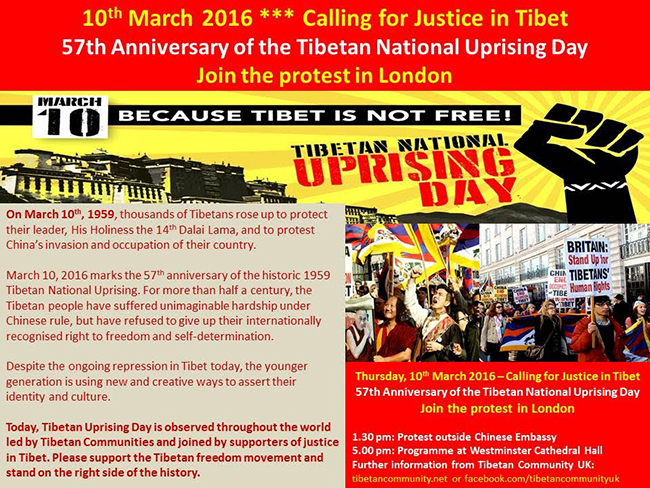 March 10, 2016 marks the 57th anniversary of the historic 1959 Tibetan National Uprising. For more than half a century, the Tibetan people have suffered unimaginable hardship under Chinese rule, but have refused to give up their internationally recognised right to freedom and self-determination. Despite the ongoing repression in Tibet today, the younger generation is using new and creative ways to assert their identity and culture. The spirit of their resistance is alive both in Tibet and in exile, as we see a new wave of young Tibetans taking up the torch of Tibet’s nonviolent freedom struggle. On Marth 10th, Tibetans around the world stand united, belonging to one nation, with a proud history of resistance. Please support the Tibetan freedom movement and stand on the right side of the history. Tibetan Uprising Day, observed on March 10, commemorates the 1959 Tibetan uprising against the presence of the People’s Republic of China in Tibet. The failure of the armed rebellion ultimately resulted in a violent crackdown on Tibetan independence movements, and the flight of the Dalai Lama Tenzin Gyatso into exile. 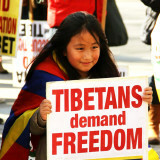 Today, Tibetan Uprising Day is observed throughout the world led by Tibetan Communities and joined by Tibet supporters.